There isn’t too much to a standard set of stairs. They go up and they come down, connecting the floors, and the most you expect is that they don’t collapse under your weight. But straight up and down can be so boring. Some stairs, however, reach up outside the box of ordinary design and present us with something different. Here are six of the most original and slightly insane. Inside this beautiful bookshop in central Porto, Portugal lies the most ornate and beautiful gothic and art nouveau-inspired staircase. From above the red floored stairs fan out like a whirlpool before reaching in both directions and the underneath is just as astonishing as the top. The bookshop is said to have inspired JK Rowling while writing the Harry Potter series and it’s not hard to see why. You wouldn’t want to be faint of heights when facing this steep decline. Jamestown is the capital of the island of Saint Helena in the South Atlantic Ocean and as it’s built on igneous rock, in a narrow divide, and surrounded by steep cliffs, it’s rather difficult to negotiate. Jacob’s Ladder is a famous set of dangerously steep steps into the town and now is a tourist attraction. The stairs are lit at night and a timed run takes place each year. 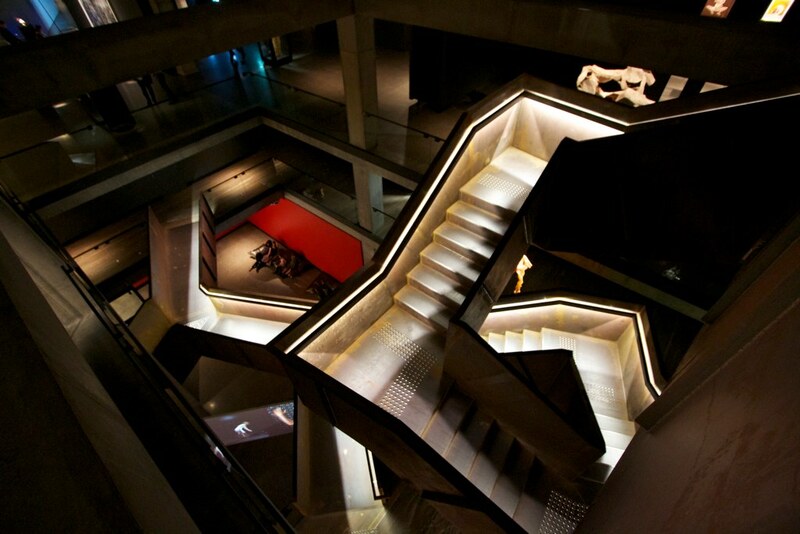 This beautiful museum of old and new art in New Zealand is a quite the piece of work itself. Magnificent and dream-like, the stair sequence of steel and concrete stairs and walkways twist and turn in unexpected ways throughout the building to deliver the ‘viewer’ to the next level. No matter the exhibition, these stairs steal the show. The Akita museum in Japan, built by Japanese award-winning architect Tadao Ando, is a contemporary building in design and dedicated entirely to the artist Tsuguharu Foujita. Foujita was a Japanese-French painter who was highly regarded for bringing japanese ink-style paintings to the west. These stairs designed by Ando, appear to hang, almost invisibly in the air, inside the museum. This beautiful church showcases its use of clay Dutch bricks and the in dutch building style that favours durability along with simple, beautiful design. What makes this staircase interesting is the inside-out approach, where the stairs appears dangerously unsupported but is really a celebrations of engineering and architectural design. Why have one staircase when you can have lots of tiny little ones? Abhaneri is a village in the district of Rajasthan in India and Chand Baori is one of the most famous landmarks. There are 3,500 narrow steps to descend which makes it the deepest and largest stepwells in India. Built between AD 800 and AD 900 it was dedicated to Hashat Mata, the Goddess of Joy and Happiness. As the air is generally 5-6 degrees cooler than at the surface, locals gathered at the bottom for activities at the height of summer.